For this week’s WHB entry, I finally tried a recipe that I’ve had my eye on for weeks. Aloo Paratha from Veggie Cookbook. Aloo Paratha is an Indian flat bread that is stuffed with spiced mashed potatoes. Aloo=potato Paratha=a type of flatbread. I’ve never attempted any type of Indian bread. I’ve read about lots of different types of breads: roti, chapati, paratha, naan. I’ve even found and watched videos online of how some of them are made. I just hadn’t tried any on my own. Sometimes I feel a little intimidated trying something brand new, especially when I have never seen or tasted something similar. But the great thing about food blogs is that not only will you often find step-by-step photos to help you along, you can usually e-mail the author with any questions or concerns you have about the recipe. How many times have you been looking through a cookbook or magazine, seen a great recipe or photo but then realize that the instructions are somewhat confusing. Haven’t you ever wished that you could just call up the cookbook author and ask for clarification? Well, thanks to the internet, you can often do just that. Food blogs are especially useful when you want to learn something about a new cuisine that you are completely unfamiliar with. In the last couple of years, I’ve become very interested in South Asian food. We didn’t have Indian restaurants of any kind in my hometown. The only Indian food I had ever really tasted was from fast food places in mall food courts. Sad, I know, but true. But through cookbooks and blogs, I’ve learned a lot about spices and cooking methods and I find myself falling in love with the South Asian cuisine without ever having set foot in an authentic restaurant, much less the Indian subcontinent. When I first started reading Indian cooking blogs like Padmaja’s Veggie Cookbook, I was dying to try many recipes but found that many of the ingredients were unfamiliar to me and, living here in Sicily, I didn’t even know how to begin to stock my kitchen with the essentials for these types of dishes. But I kept reading, started asking questions, and found that many of the unfamiliar ingredients weren’t unfamiliar at all, they were just being called by different names (for instance, cilantro vs. fresh coriander or haldi vs. turmeric). I also found an international foods store here in Catania that stocks all of the spices and ingredients that I hadn’t been able to find in the Italian stores. I purchased Madhur Jaffrey’s book Indian Cooking which has an excellent basic introduction to Indian spices, seasonings, and flavorings and have since bought another one of her books. Between the cookbooks, blogs, local international foods store, and The Spice House, I now have a pretty good understanding of the basic ingredients needed to experiment with Indian cooking in my kitchen. I have stocked my pantry with every whole spice I can get my hands on. I was already in the habit of keeping potatoes, onions and garlic on hand at all times but now I also keep a ready supply of fresh coriander, ginger, fresh plain yogurt, and hot chiles. I’ve found that now I am able to try all kinds of new recipes without having to rush to the store to find special ingredients. And I’ve also had fun incorporating new ingredients, spices, and cooking techniques into recipes I create on my own. So, back to the bread! When I was looking over my list of ‘must-try recipes’ and went back to Veggie Cookbook to re-read the recipe for her Aloo Paratha, I happily realized that I had all the ingredients I needed to finally attempt it. Padmaja gives fairly detailed instructions and provides good photos with the recipe but I was still a little nervous about rolling out the dough. I left a comment on her blog saying that I was finally going to attempt it and she was kind enough to e-mail me with some additional pointers and to let me know that she would be available to answer any questions if I started having problems. It turned out that I didn’t have any problems with the recipe at all but it was nice to know that help was waiting for me if I needed it! This is what sets food blogs apart from traditional cookbooks, cooking shows, and large recipe Web sites! The stuffed parathas were really tasty! I did end up with too many potatoes but I took care of that problem by just eating the leftovers! Padmaja says her family likes to eat them for breakfast but I ate mine for dinner with some cool and creamy plain yogurt. As these are made with whole wheat flour, they are extra nutritious and filling! And now I am finally getting to the Weekend Herb Blogging part of this post! The fresh herb that I used in my Aloo Paratha is cilantro, or fresh coriander. As I’m sure I’ve mentioned before, I have always loved cilantro, but for most of my life, my knowledge of the herb was very limited. As far as I knew, cilantro was only used in Mexican food, mainly salsa and guacamole. I had no idea that cilantro is actually referred to as fresh coriander by the rest of the world. I had no idea that it is used extensively in cooking throughout all of Asia. Essentially, I was completely clueless when it came to cilantro, er, fresh coriander. Another thing I was clueless about is how to store the herb for more than a day without it wilting! Fresh coriander has to be one of the most sensitive herbs I’ve ever dealt with. It seems that even looking at it wrong will cause it to wilt! Well, it turns out, it’s not too difficult to keep a bunch of fresh cilantro healthy and happy for up to a week or even longer if you take care of it. Simply place the roots or stem ends in a jar of water, much like you would place a bunch of flowers in a vase. Then cover the top with an overturned plastic bag. Store it in the fridge, pick off dead leaves as you see them and change the water if it gets murky. 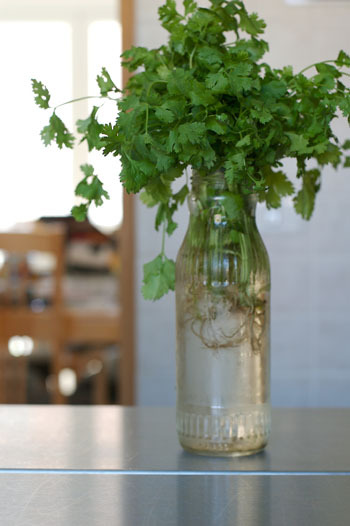 Your cilantro will perk right up if it was looking limp and it will be ready to use whenever you need it. The cilantro in this photo has already been in my fridge for over a week! Believe it or not, this was going to be just a short post with a photo of my stuffed parathas, a link to the recipe, and a quick tip about storing cilantro! This is what happens when I drink a little too much coffee before sitting down to write! And sometimes I just get really excited about the way the internet is changing the way we learn about food and cooking and I just can’t shut up about it! Please remember that if you ever have any questions about a recipe I post or any food-related questions at all, you can leave a comment or e-mail me through my contact form and I will do my best to get back to you as soon as possible! And of course I also love to receive recipes and tips from you, too! This week’s Weekend Herb Blogging roundup will be held by Chris at Mele Cotte. If you want to learn more about Weekend Herb Blogging, including who will be hosting WHB in the coming weeks, visit Kalyn’s Kitchen. Once again, here is the link to the recipe for Aloo Paratha. You can learn more about cilantro and find some great recipes at Kalyn’s Kitchen. I am so glad this wasn't a short post! I learned a lot. And, I think you hit the nail on the head with what you said about the helpfulness of food blogs.Thanks for participating! That really was a long post.Being an Indian and having a little hand in cooking made me curious about the blog, its well written and very smartly linked. I like the cilantro in fridge trick which is new to me, since I never keep it in fridge for more than a day or two as its readily available in India. You have had quite a bit of coffee. I can't wait to print this one out and have it by my bed side for night time reading. I've been looking for a new book:):):)Kidding. I am looking forward to reading this. Admittedly I have not yet. Tomorrow morning. I just saw the cilantro and how lush it looks and overfloweth. I have cilantro in my window that has been growing for a few weeks and flowering. I have heard about putting cilantro in water like that, but always wondered whether it would really work. I'm impressed that you've made your own paratha! I'm pretty intimidated by a lot of Indian recipes myself, although I have been learning a lot from the Indian food blogs I read. I agree, it's truly wonderful how the internet helps us all learn from each other.BTW, I am absolutely LOVING the book Herbs and Spices that you recommended. Dear Nicole, thanks for linking it to my blog. One more tip for storing "Cilantro" as you say or Coriander as I say:), Use n throw boxes or to-go boxes they come really handy to store fresh herbs, I often store to-go boxes. Wrap the herb in paper towel (kitchen) and put it in the box (with lid) and then keep it in the fridge. It stay fresh more than 2 weeks. Give it a try with basil & parsley. It really works. When even you see a dead/ spoiled leaf/stem just remove it remaining stays fresh. Hope this tip will help you. I'm really glad you enjoyed paratha's. I usually make it for dinner and left overs follow for breakfast. I actually make a big batch and keep it in the fridge and sometimes I freeze. It comes really handy. My Indian friend at work recently made potato dumplings filled with vegetables for a potluck. He is a vegetarian and loves to cook. They were super yummy, a real hit with the crowd. Today Ron decided to grill chicken wings. He loves Red Devil sauce and used the recipe off of the bottle. Was really simple, marinate it in Italian dressing with Red Devil for a few house. He looked online to research how to grill the wings (indirectly, directly etc.) did a Google search and came accross Pinch my Salt! haha One of your recent Nando's chicken wing posts. That's awesome huh?! ?He also made a blue cheese dip that would have had you drooling if you saw him make it. Had mayo, sour cream, blue cheese, apple cider, pepper, worcestershire and garlic. WAS SOOOOOOO FREAKING GOOD!! My Aunt Susan was visiting from Monterey and loved it so much she wanted him to make a second batch so she could bottle it up and take it home...hehe!Anyhow, I love cilantro "coriander" i even add to my salads and vegetable entrees. Great post! This is one of my favourite kind of flat-breads. Yours soft and moist. Nothing better then Indian food, especially when its vegetarian. Not that I would know, but if I lived in my ideal world, I imagine that most of my food would be flavorful, spicy, and meat free.And to Ruby: Red Devil sauce? I thought Ron could do better then that. Tell him to come check out my hot sauce inventory. Wow, thanks for the great post! I too often feel somewhat intimidated to try totally new things in the kitchen. I still have yet to make a risotto because it frightens me somewhat. The same for Indian cooking. But, how can one resist mash potato filled bread??? A lot of great information you presented. Enjoyed reading it Nicole. And recognized your tip on cilantro right away. My mom used to store her cilantro that way. And she loved to put it into almost any meal she cooked for us. She loves the smell of cilantro. Used to, because her cooking interest has declined somewhat. Thanks again for sharing info w/us. enjoy reading it and is motivating for a non-cook like me:) Was actually baking last night w/Chris. Used our awesome mixer for the first time. Miss ya--looking forward to your visit. yum!!! bread stuffed with mashed potatoes. what's not to love. wow what a great idea for the cilantro. I love that stuff and what a great way to make it last longer! Oh wow! Don't you wish that there were Foodie Couriers so we could all send each other samplings? In Singapore, we have our own version of "roti prata" which is flakier...more like a croissant than a flatbread. It's a universal snack! You also get them in the freezer section and you just heat it up in your frying pan like a quesadilla. There are loads of flavours but sometimes I just like the plain with some butter and sugar sprinkled over the top. We're starting to see fusion adapts too - like cheese & sausage roti prata wraps etc. DELISH! Wish I could send you some! Keep the coffee coming, Nicole---what a wonderful post! I love cilantro too. It finds its way into salsas, a white chili I don't make often enough and sometimes just chopped and sprinkled over pan seared fish or chicken. Now I'm sitting here thinking of other ways I might use it, and I haven't even had any coffee. I was fortunate to marry into an East Indian family, and have been since been spoiled by my mother-in-laws wonderful cooking. It has definitely been quite fun learn to make her recipes, and many others now, in my own kitchen! Of course with guidance from many different blogs ;)Also thank you for the coriander storage tip! I am going to have to try that one out. Thanks for the cilantro storage tip. I am forever having bunches of cilantro go bad in my fridge, so that's a perfect idea for prolonging its life. You have the most soothing site. I lost track of you for awhile, but I love visiting your blog. The food pictures are so great. I'm not sure I could make anything you do, but it looks delicious. Yes, that is THE best way to store cilantro! It will last forever like that. I stored a half-used bunch just like that before going on a ten day hiking trip, and came back to find it just as happy and healthy as when I left it. Hi there. I found your blog by searching for a pistachio pasta recipe. It's my favorite thing to eat at Family Cafe on 417, and I was curious if my guess about how it's made comes close. It does. We also live in Sicily, nearing the end of our tour as well. Thanks for the tip on cilantro. I've read that it works well for basil too, but I've had no luck. I think the stems are too short. Just wanted to say hi to a fellow blogger at Sig. Dag from Amsterdam! Found your blog from Mae's. What an idea. Never thought of cilantro with pratha, but hey that's what creative cooking is all about. I have this cilantro and avocado burger recipe I should blog about. Ciao Nicole! I love flatbread. I recently made naan at home, and it was pretty good. Not the same as when it comes hot out of the tandoor, but fun nonetheless. Yours looks soft and wheat-y! You can also loosely wrap the cilantro in a paper towel then put it back in its plastic bag, roots first. Leave the bag open so the herb can breathe. It will last quite a while this way. If you can obtain the broad-leaf "culantro" version of the herb it is longer lasting and a deeper, more pungent flavor. It can usually be found in Spanish markets. Pinch the leaves and you'll smell the distinctive aroma. hi nicole! i hope everything is going well with you. I can't wait for you to reemerge back into posting beautiful yummy things.... and to tell us all about blogher! take care! I'm Indian and I simply love Aloo parathas! And the coriander photograph reminds me, aloo paratha doesn't taste like it's complete without the coriander topping ( and ofcourse, the very finely sliced fresh green chillies! ). I do not even know the way I ended up here, but I believed this publish used to be good. I do not realize who you are but certainly you're going to a famous blogger should you are not already. Cheers! Hi, this weekend is pleasant in support of me, because this moment i am reading this enormous educational post here at my home. 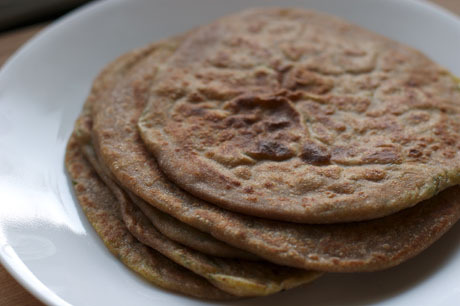 I tried this aloo paratha recipe and it just tastes awesome. I also recommend everyone to try this at least one time they will love it. Thanks for sharing such amazing recipe.